Is Volkswagen-Chattanooga “drawing a charge” after UAW’s “micro-victory”? U.S. Department of Labor moves forward with new "persuader" regulations, expected in March 2016 - As we have previously reported, the U.S. Department of Labor has long wanted to revise the "persuader" reporting rules under the Labor Management Reporting and Disclosure Act. The DOL announced in a regulatory agenda issued toward the end of 2015 that it expects to issue the persuader rule in March (that's two months from now). Current regulations require employers and their labor consultants who engage in "persuader activity" to file extensive reports about their use of consultants and lawyers. 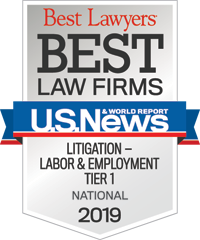 However, the current regulations contain an "advice exemption" for attorneys and consultants who assist employers in labor relations activities so long as the activities are "advisory" to the employer (that is, the attorneys and consultants communicate to the employer and do not directly communicate with employees). The proposed regulations are expected to narrow that exemption, essentially to limit exempt "advice" to providing representation in legal and administrative labor-related proceedings. Such a narrowing will largely swallow the advice exemption and mean that many more entities – employers, attorneys, and consultants – will have an obligation to report extensive and detailed financial information on labor relations activity, expansively defined, on mandatory DOL forms. The reporting obligations are huge, costly to those subject, and come with potential criminal sanctions for failure to comply. Since at least 2011, the DOL has held back on issuing its new final persuader regulations, presumably because of the political and legal firestorm that is expected. Opponents of the new regulations point out that the new interpretation of the advice exemption will encroach on the attorney-client privilege and deter smaller employers from seeking legal advice in labor matters, which is expected to hinder employer effectiveness in union campaigns while also increasing the risk that employers will commit unfair labor practices because they don't have the benefit of legal advice. The regulations have now been submitted to the Office of Management and Budget, a near-final step in the process. Court challenges are likely, but employers, their counsel, and their consultants should begin to prepare if they have not done so already. Is Volkswagen-Chattanooga "drawing a charge" after UAW’s "micro-victory"? - On December 14, the National Labor Relations Board certified the results of the UAW’s December 4 election victory (108 for the union, 44 against) for a skilled maintenance bargaining unit at Volkswagen's plant in Chattanooga, Tennessee. The plant has approximately 1,400 total production and maintenance workers, but the UAW focused on the "micro" unit of skilled maintenance workers after it lost an NLRB election in the overall plant group in February 2014. The micro-unit consists of only about 12 percent of the wall-to-wall bargaining unit that the UAW tried to represent in 2014. We expect the Board to rubber-stamp its Regional Director's actions in the election case and then for Volkswagen and the NLRB to file cross petitions for review and enforcement, respectively, in a federal appeals court. At this stage, Volkswagen's position has not been announced publicly, but we expect the company to argue that the micro-unit is inappropriate. This could be difficult: Volkswagen will probably have to convince a federal appeals court that the workers in the micro-unit share an overwhelming community of interest with the other plant workers. German union sets up shop near Nashville, sets sights on Southerners and suppliers - Meanwhile, possibly smelling blood, the German labor organization IG Metall announced in November that it is establishing an office in Spring Hill, Tennessee, a suburb of Nashville that has a General Motors plant. IG Metall apparently plans to coordinate activities for organizing across the South with the UAW and to continue to push the idea of European-styled work councils. In a press statement, IG Metall noted that approximately 100,000 U.S. workers are employed by German auto companies, and that the vast majority in the South are not represented by a union. Both IG Metall and the UAW have said that auto workers in the South are not getting a fair share of the benefits of what the unions claim is an improved market for automobile manufacturers. Look for the UAW and IG Metall to continue the organizing efforts at Volkswagen and to attempt to establish a union presence among suppliers to Volkswagen and other automakers. The unions are expected to probe for weak links among suppliers, who may lack the resources, skill, experience, or will to counter the unions’ efforts to gain membership and bargaining rights. NLRB panel majority finds unlawful Whole Foods’ policy prohibiting employees from secretly recording conversations - In a December 24 decision, a divided panel of the NLRB refused to accept the recommended decision of an administrative law judge and found that two of Whole Foods' policies restricting workplace recording by employees were unlawful. One policy prohibited workers from making video or audio recordings of meetings without approval of management or the consent of all parties to the conversation. The stated purpose of the policy was "... to encourage open communication, free exchange of ideas, spontaneous and honest dialogue and an atmosphere of trust." The second policy prohibited workers from recording conversations without management approval. Its stated purpose was "to eliminate a chilling effect on the expression of views that may exist when one person is concerned that his or her conversation with another is being secretly recorded. This concern can inhibit spontaneous and honest dialogue especially when sensitive or confidential matters are being discussed." This is but one of many recent Board decisions finding that a common employer policy or workplace rule is unlawful under the current Board majority's expansive view of Section 7 rights and minimalist view of employer prerogatives. Whether the decisions generate positive or negative results for employees remains to be seen and is subject to debate. Many of the decisions seem simply to reinforce the current Board majority's view of the workplace as an adversarial environment and to attack legitimate employer policies intended to make the workplace more civil and productive, in the interest of both employers and employees. Is there an app for that? Well maybe not an app, but there sure is a website - Two former employees of the Service Employees International Union have created a website – coworker.org – that they say is intended to allow employees to gather, organize, and create change in their workplaces. According to a Fast Company article, the website is currently hosting hundreds of initiatives for change in various workplaces. "We're codesigning new forms of collective advocacy power for workers which don't replace trade unions," co-creator Michelle Miller was quoted as saying. "They are actually new kinds of models that sit next to trade unions as options for workers to start to think about ways in which they want to have organizational power inside their workplaces." In any event, employers – especially those in the retail, hospitality and restaurant industries and those which have large numbers of geographically dispersed employees – will want to pay attention. If the website is successful, more such websites and apps are sure to follow. IBEW, union-busting evil employer! - Connecticut-based Local 42 of the International Brotherhood of Electrical Workers employs clerical workers who belong to the American Federation of State, County, and Municipal Employees union. According to the clericals, who went on strike in November, the IBEW is anti-union and was acting badly – just like an employer. According to the president of the clerical workers' union, quoted in the Journal Inquirer, the IBEW "outsource[d] bargaining unit work to a non-union supervisor," and cut one employee's pay by $15.44 an hour. "I think it's a shame that Local 42 has decided to treat their employees in this way," the AFSCME local president was quoted as saying. "You can't claim to be an advocate for working people and, at the same time, seek to outsource work and significantly reduce your employees' pay." In the leadup to the strike, the clerical workers' union apparently filed an unfair labor practice charge against the IBEW, claiming "anti-union animus." Can that be right? Maybe these clericals would be happier working for a nicer employer – maybe one that isn't a union. Restrictive work scheduling legislation begins to gain traction - As if there were not already enough seemingly well-intentioned but productivity damaging workplace laws and regulations, new work scheduling laws are being proposed at federal, state, and local levels. At the federal level, Sen. Elizabeth Warren (D-Mass.) in July 2015 introduced the Schedules That Work Act. The proposed legislation has little chance of success in a Republican-controlled Congress in 2016, but it is worth watching. Generally, the bill would require employers in the retail, food service, and cleaning industries (as well as others that may be designated by the Secretary of Labor) to provide each new hire with a written work schedule, including the minimum number of hours that the new hire will be assigned to work each month. If that initial schedule changed, the employer would be required to provide another written notification at least 14 days in advance of the date that the change would take effect. Among other things, the bill would also require minimum "reporting pay," which applies if an employee is scheduled to work a certain number of hours but is not actually given that amount of work after reporting; and extra pay for on-call time, split shifts, and schedule changes made on an "as needed" basis with less than 24 hours' notice. Not to be outdone or willing to wait for federal legislation on the subject, a District of Columbia Councilmember on December 1, 2015, introduced the Hours and Scheduling Stability Act of 2015 in Washington. The proposed law, which would apply to retail employers with at least five locations across the country and to restaurant chains with 20 or more locations, would require covered employers to offer available work to current employees who are qualified before hiring new employees or using subcontractors. The announced intent of the proposal is to promote full-time work. The D.C. proposal would also require employers to post schedules 21 days in advance of work and to pay workers up to four hours of pay if an employer changes a schedule. Schedule changes would have to be disclosed to the employee in advance, and a revised written schedule would have to be provided within 24 hours of the change. If an employer wants to add work time to an existing schedule, the employee may refuse the work. Any voluntary acceptance of added work by an employee would have to be in writing. Employers should watch for more legislative proposals like these. In 2014, similar legislation became law in San Francisco despite vigorous opposition from local business groups, and comparable proposals are being considered elsewhere. The common thread in all the proposals is that they limit the ability of the employer and employee to negotiate on a full range of mutually advantageous arrangements and to agree on ones that could compensate the employee for flexibility in scheduling that some employers and employees desire.